In the history of Christian thought, pursuit of the knowledge of God has always held the position of highest honor. There are two ways by which objective knowledge of God can be acquired: the study of His revelatory works, i.e., the Bible (known as special revelation), and the study of His creation, under the assumption that what is made reflects truths about its Maker (this is known as general or natural revelation). With that preamble, I must confess that two days ago an observation of the natural order led me to a theological conclusion that I have never seen in the Bible before. It answers the question, “Why did God create humans on the sixth day as His final act?” as taught in Genesis 1:26-27. The traditional answer has always been that God saved the best for last, so to speak, creating Man as male and female in His image and likeness both to honor human beings and to crown His creative efforts with His most glorious masterpiece. I have nothing against this view — in fact, I quite agree with its high view of human dignity and our place in God’s purposes. However, my new insight adds some rich texture to the answer, not found in most theological commentaries. 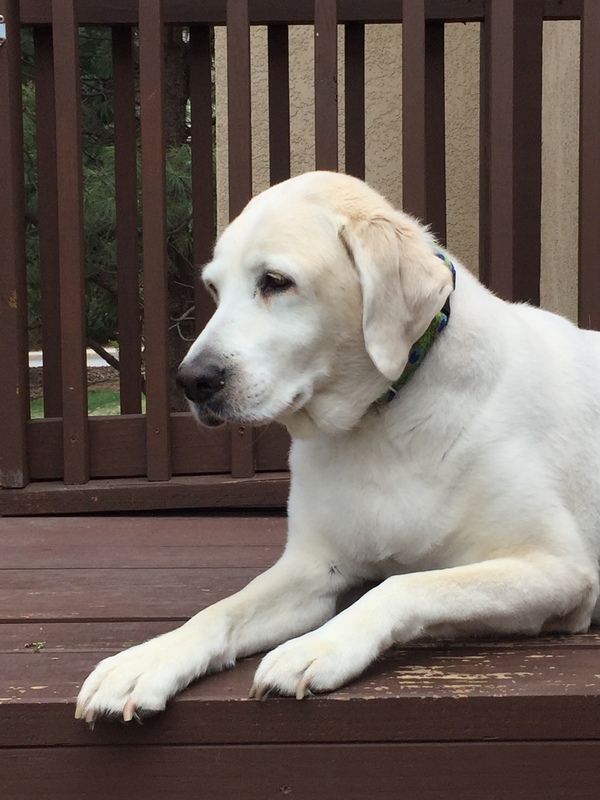 Since I owe much of the credit for this truth to my yellow labrador retriever, I have named this insight “Haley’s Hypothesis.” Here’s how it came about. Two days ago, in the late afternoon, I prepared the backyard for its first mowing of the season — weeding, discarding dead branches, raking dead spots and clearing any obstacles so I could bring order out of the chaos engendered by winter. As I fired up the mower and started on one side of the yard, Haley laid down on the other side to watch me. At the end of the first row, I turned the mower around to come back, and looked at the fresh-cut swath I had just finished — it looked good! Each successive row added to the beauty. 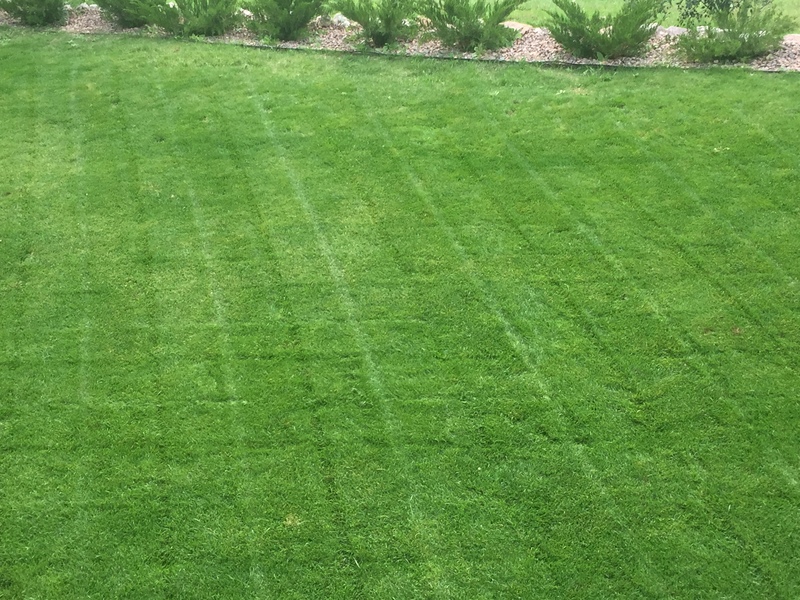 When I got about halfway through the yard, I compared the cut section to what was left and felt a rush of delight. But there was still work to do before the sun went down, so I turned my attention to the grass ahead of me and pushed on. This is where Haley enters the picture in a more active way. She wanders about twenty feet ahead of me, directly in my path, and squats nonchalantly, leaving a pile of skubala (for non-Greek students, that’s excrement) right where the mower is headed. That’s when it dawned on me. Perhaps the reason God waited until the end to create Man was because He knew of the human penchant to befoul our surroundings (which of course didn’t take long — see Genesis 3) and He wanted the undisturbed joy of unfolding His beautiful works without having to stop to clean up untimely messes produced by the apple of His eye. So, perhaps the real reason humans were created on the last day after everything else was in place was so that God could hum with undisturbed joy in getting everything just right before letting Adam and Eve out onto the perfectly mowed backyard…. That’s Haley’s Hypothesis in a nutshell. But keep in mind, it might be a total load of skubala. Secular Western analysts of Islamic militancy typically miss the boat when seeking the root causes spurring Muslims to engage in violent jihad. Since the analysts themselves have no galvanizing religious faith upon which they build their lives, they can’t imagine that religious faith could be a serious motivator for anyone else — they are blinded by their own bias. Hence, we often hear in the mainstream media that what really motivates new recruits joining ISIS, al-Qaeda, Boko Haram, al-Shabaab, etc. 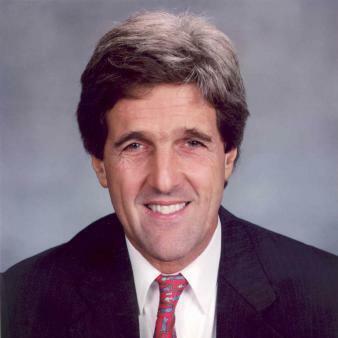 is not religious conviction but rather a desire to flee poverty and disenfranchisement (as John Kerry argued in 2014), to topple politically corrupt regimes, to escape the dreariness of a meaningless future, or to combat other social injustices. Only motivations as powerful as these could compel a terrorist to face death willingly. Religious motivations, as everybody knows (in the world of secularism), are silly and groundless, so they cannot provide an adequate foundation to explain the terrorist’s mindset. Their dismissal amounts to this: “Since I cannot conceive of the possibility that religious faith might be of ultimate importance, to the point of sacrificing my life in its pursuit, it must not be possible for anyone else (except, of course, for those who are mentally unbalanced). As a result, we find that though militant Muslims ascribe their actions to their religion (quoting copiously from the Qur’an, reciting authoritative martial accounts of their peerless prophet, slavering over the sensual delights of paradise promised to those who kill and are killed for Allah (Qur’an 9:111), our elite analysts know better. “Islam,” they say, “has nothing to do with terrorism and militancy and conquest. It is a religion of peace. These militants have hijacked Islam and perverted it — they don’t really believe it, but are using it as a front for their real agendas — economic advancement, destruction of political enemies, and so on. However, when one gets a chance to listen to militants who describe how they were originally recruited, it becomes clear that our secular analysts haven’t got a clue. Time and again, seasoned jihadis recount that clear teachings from the Qur’an and Sunna (authoritative accounts of the actions and declarations of Muhammad) convinced them that jihad for the sake of Allah was the only acceptable path for one seeking to be a true Muslim. 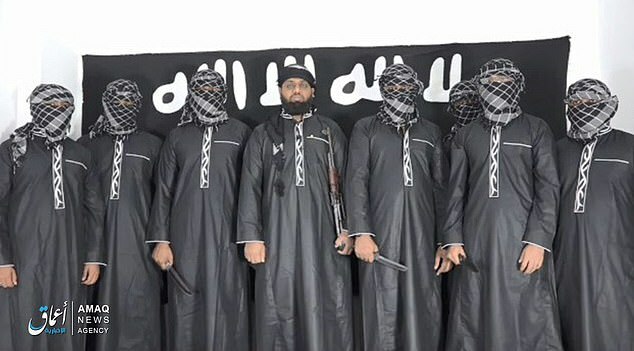 Still fresh in our minds today are the suicide bomb attacks Easter Sunday in Sri Lanka, carried out by nine local Muslims (with the support of some 60 other Sri Lankans now under arrest and the apparent help of a larger Islamic terror network, perhaps ISIS). Authorities are now reporting concerning the nine suicide bombers that they were all “well-heeled” and “well-educated,” from middle- to upper-middle-class families, once again putting the lie to the claims of John Kerry and expert Western analysts that terrorists are made primarily by poverty and social victimization. Sadly, the culprit turns out to be the religion of Muhammad as taught in the Qur’an, Hadith literature and the early histories of Islam, all revered Muslim documents. Historical Islam is inherently jihadi, and the more seriously a Muslim entertains patterning his/her life after that of Muhammad, the more he/she is drawn to totalitarian violence against all who resist submission to Islam. Its capacity to woo willing pawns eager to kill and be killed for the sake of Allah so that they may earn a ticket to paradise must not be underestimated. Religious convictions can be the most powerful human motivators toward the advancement of good or the fomenting of evil. Until Western, secular leaders wake up to this fact and decide to face squarely the threat of Islam to Western civilization, we will continue to take body blows to our cherished freedoms and Judeo-Christian values. If we will not define the enemy clearly and precisely, fear and paralysis will lead us to capitulate to those ever willing to tyrannize us until Islamic law reigns supreme. She remarks that on that fateful day of the attack, while working as a physician in Riyadh, Saudi Arabia, she turned on the TV at 4 pm to witness live the World Trade Towers being hit by hijacked jetliners. 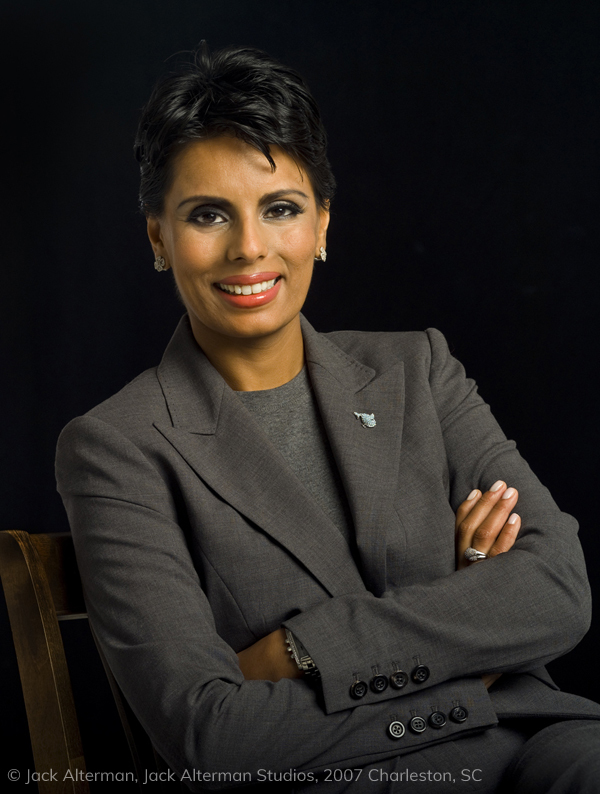 “Living at the time in the Saudi Kingdom – the epicenter of Islam – as the world learned the identity of the 9/11 terrorists, I wondered how my religion had been hijacked by suicidal killers who claimed they had a religious duty to kill innocents. One wonders about the reaction of the many Muslims around her in the streets of Riyadh at the first news of the jihadi attacks on the USA. Were they as horrified as she, or was there dancing, horn-honking and the sharing of sweets at this blow struck against the Great Satan, as America is labeled from the pulpits of mosques across the Islamic world? Perhaps Qanta Ahmed will share her recollections with us someday. Nevertheless, Ahmed herself is desperate to show that the Islamism of the hijackers is a poison that has nothing to do with the death cap mushroom of true Islam. So, from where do these deviant radicals get their non-Islamic ideas that they associate with Islam? Could it be from any of the 109 verses addressing jihad that are found in the Qur’an, or the numerous Qur’anic decrees painting disbelievers and hypocrites (vacillating Muslims) as the enemies of Allah whom true believers as instruments of Allah’s wrath are called to punish? Could it be from “holy texts” that promise those who kill and are killed in the way of Allah that they will find eternal sensual pleasures beyond imagining as a reward for their brutal conquests on earth? Might their penchant for terror find its roots in the example of their prophet, whom the Qur’an presents as the “beautiful pattern” (33:21) for all human beings to emulate? It is Muhammad, according to the most reliable of Hadith sources, who declared, “I have been made victorious through terror” (Sahih Bukhari, 4.52.220). “Be strict in observing justice, and be witness for Allah, even though it be against yourselves or against your parents or kindred,” the Koran says in Chapter 4, Verse 36. One evidence that the Qur’an is not really very important to Qanta Ahmed’s understanding of Islam is the fact that she misattributes this text to Sura 4, v. 36. 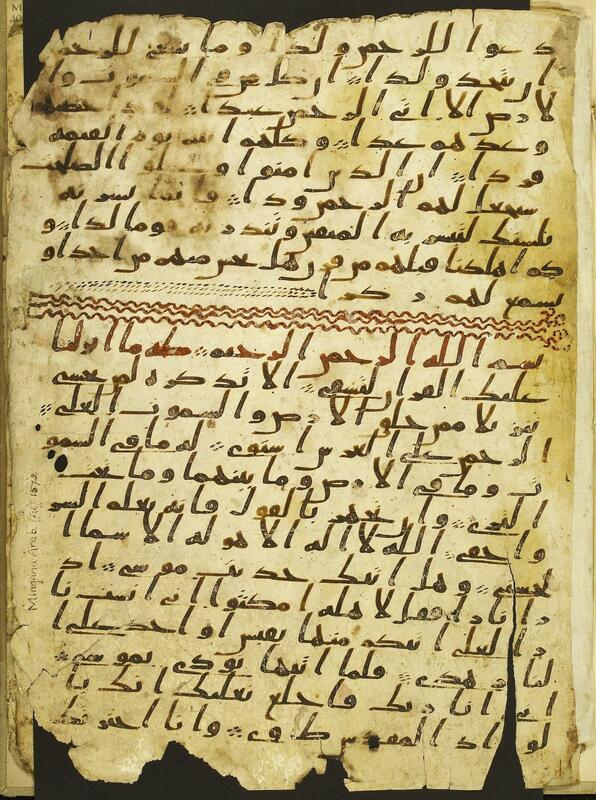 As a matter of fact, the text she quotes is found in Sura 4, v. 135 — only 99 verses later…. And there are two points to make with regard to this boilerplate teaching on justice: first, every religion worth its salt claims that justice is a virtue that shows no partiality, for partiality whether to parents or kindred or self is obviously a denial of justice. Islam is not to be lauded for promoting something so obvious, and found in all major religions. Second, justice in Islam is defined by the decrees of Allah, which are weighted in favor of believers and against disbelievers. This is why Islam enshrines jihad warfare, slavery, sexual abuse against non-Muslim girls and women, and dhimmitude status on recalcitrant Christians and Jews. Such treatment is just, because Allah declares it so. In Allah’s kingdom, non-Muslims do not share the “justice” that Muslims are meant to enjoy. Yet even if Islam championed true justice, as the other religions do, that is not the issue. What sets Islam apart is not where it agrees with the other religions of the world, but where it differs — and on this front Qanta Ahmed wills herself to be blind. Islam is the only religion whose god demands his followers to pick up the sword to advance his kingdom until all the world is conquered; whose god tells his subjects they are the best of all peoples, and non-Muslims are the vilest of all created beings; whose law threatens doubting adherents with beheading should they recant their allegiance. Ahmed has created a fantasy Islam in her own mind, one which ignores the vast evidence of Islamic texts and history, and from this castle in the sky she launches attacks against Ilhan Omar, whose Islam sadly is much closer to the Muslim Brotherhood and that of the 7th C. desert prophet himself. One could wish that Ahmed’s version of Islam were true, but to act as if that were the case would be like sauteing a large batch of death cap mushrooms on the advice of a foolhardy chef and serving them to friends and family — deadly. Astonishing legal news was announced this morning from Illinois — the Cook County office of the State Attorney revealed that all charges filed against Jussie Smollett have been dropped and the evidentiary record has been sealed, meaning that nobody will have access to whatever evidence police investigators uncovered that originally led to the grand jury indictments and criminal charges. Not surprisingly, the police and city administration are livid, after spending a voluminous number of hours and signficant dollars in the effort to track down Smollett’s alleged attackers, only to find two brothers, friends of Smollett’s who confessed to being part of a hoax cooked up by Smollett himself, according to their testimony. We may never know what really happened with the Jussie Smollett “incident.” But something definitely does not smell right in this slurry of contradictions. Most revealing is the fact that neither Smollett nor his attorneys nor the State Attorney’s office has called for the reopening of the investigation to track down the white, racist Trump-supporters that allegedly perpetrated the crime in question. The police apparently have no intention of further investigation, unless forced by their superiors, for they are convinced they discovered the truth. Jussie Smollett seems relieved and content to be off the hook. His courthouse statement lacked any mention of bringing his alleged attackers to justice, only his gratitude for not being under the microscope any longer. That doesn’t ring true to my way of thinking. Even O.J. Simpson, when acquitted of the charges that he murdered Nicole Simpson, declared that he would spend as much of his life and resources for as long as it took to track down the real killer(s). Of course, he didn’t do either, but his statement at least counted for a sympathy vote in the minds of those people who thought he was innocent. Jussie Smollett didn’t even think to attempt this tactic. He is just soothed by the incomprehensible legal maneuver of the Illinois State Attorney’s office to wipe the slate clean and seal all records. Perhaps his lawyers or friends will advise him to declare his intention to track down his attackers and bring them to justice. That would, at least, play well in media circles, even if he doesn’t mean it. Will justice be done? Smollett apparently hopes not — it’s time to let sleeping dogs lie. Perhaps I’m too picky. But when you say the opposite of what you mean, especially as someone who traffics in words for a living, you deserve a little roasting….